Call it the comet that squeaked by most northern skywatchers. Comet C/2014 Q1 PanSTARRS barely made an appearance at dawn in mid-June when it crept a few degrees above the northeastern horizon at dawn. Only a few determined comet watchers spotted the creature. Two weeks later in early July it slipped into the evening and brightened to magnitude +4. But decreasing elongation from the Sun and bright twilight made it virtually impossible to see. Now it’s returned — with three tails! After taunting northerners, it’s finally come out of hiding, climbing into the western sky during evening twilight for observers at low and southern latitudes. C/2014 Q1 peaked at about 3rd magnitude at perihelion on July 6, when it missed the Sun by just 28 million miles (45 million km). The comet is now on a collision course with the Venus-Jupiter planet pair. Not a real collision, but the three will all be within about 7° of each other from July 21 to about the 24th. A pair of wide-field binoculars will catch all three in the same view. More striking, a sliver Moon will hover just 2.5° above the comet on Saturday the 18th, one day before its closest approach to Earth of 109.7 million miles (176.6 million km). Q1 has been fading since perihelion but not too much. Australian observers Michael Mattiazzo and Paul Camilleri pegged it at magnitude +5.2 on July 15-16. Although it wasn’t visible with the naked eye because of a bright sky, binoculars and small telescopes provided wonderful views. “The view through my 25 x 100 mm binoculars showed a lovely parabolic dust hood about half a degree to the east,” he wrote in an e-mail communication. 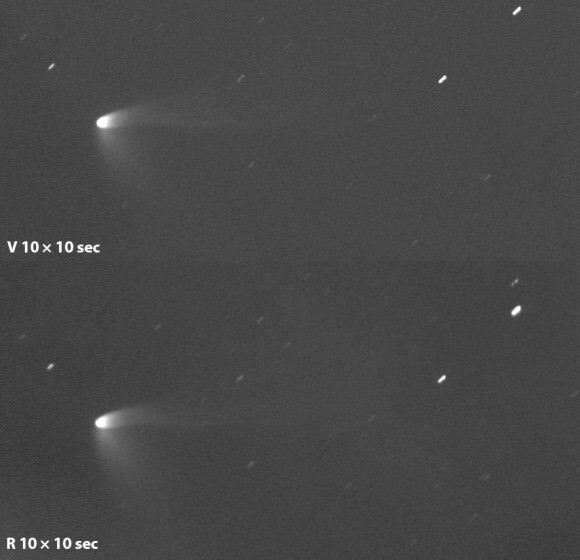 “Photographically the comet showed three separate tails, a forked ion tail about 1.5° long. Embedded within this was the main dust tail about half a degree long to the east and an unusual feature at right angles to the main tail — a broad “dust trail” 1° long to the north”. Mattiazzo points out that the unusual trail, known as a Type III dust tail, indicates a massive release of dust particles around the time of perihelion. This comet got cooked! In the coming nights, C/2014 Q1 will cool, fade and slide into a darker sky and may be glimpsed with the naked eye before moving into binoculars-only territory. It should remain an easy target for small telescopes through August. Use the map above to help you find it. For longer-term viewing, try this map. While I’m happy for our southern brothers and sisters, many of us in the north have that empty stomach feeling when it comes to bright comets. We’ve done well by C/2014 Q2 Lovejoy (still visible at magnitude +10 in the northern sky) for much of the year, but unless a bright, new comet comes flying out of nowhere, we’ll have to wait till mid-November. That’s when Comet Catalina (C/2013 US10) will hopefully jolt us out of bed at dawn with naked eye comet written all over it.